Saturday March 24th 1923 I wrote letters all forenoon to Laura, Louise Briggs, Millie, Ida, Mattie Stitt and later to Edith Whetstone as I had a letter from her. Went down town in PM with Mrs Falk to meet her friend. She did not get here. We all went down early in evening. I got my supper in town. They went to train. The lady came. Sunday March 25th 1923 We went to S S and church. Had dinner as we always do. I then went to Daytona Beach in an Auto. Rested till supper time. They walked up to Dunlaps to call. It has been very warm. Read awhile and went to bed. 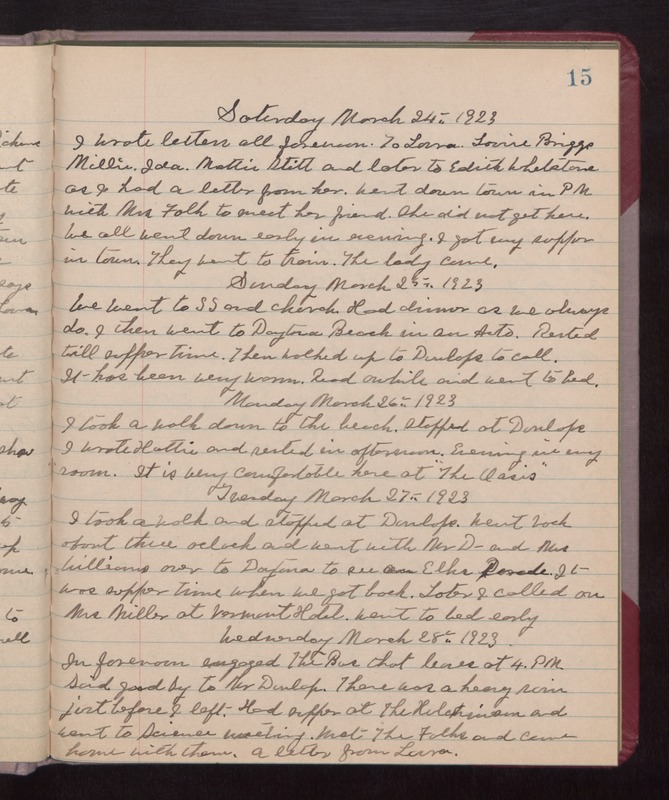 Monday March 26th 1923 I took a walk down to the beach. Stopped at Dunlaps. I wrote Hattie and rested in afternoon. Evening in my room. It is very comfortable here at "The Oasis." Tuesday March 27th 1923 I took a walk and stopped at Dunlaps. Went back about three oclock and went with Mr D--- and Mrs Williams over to Daytona to see Elks Parade. It was supper time when we got back. Later I called on Mrs Miller at Vermont Hotel. Went to bed early. Wednesday March 28th 1923 In forenoon engaged The Bus that leaves at 4 PM. Said good-by to Mr Dunlap. There was a heavy rain just before I left. Had supper at The Hutchinson and went to Science meeting. Met The Falks and came home with them. A letter from Laura.